For twenty-plus years the veteran wooden-hull tug Peter Foss built at the Foss shipyard in Tacoma in 1930 with 375 horsepower was considered the top tug for ship-assists and barge handling in Tacoma harbor. But by 1950 with the Port growing rapidly and more ships of larger tonnage arriving at the port piers, the need for more horsepower became very apparent. Foss Tacoma secretary-treasurer, Henry Foss and general manager, Orville Sund along with the Tacoma operations department created their “wish list” for the proposed new tug which was to be specifically designed for ship assist work in Tacoma. Foss contracted with Seattle Naval Architect, H.C. Hanson to design a 72-foot welded steel tug with a beam of 21 feet and a normal draft of 9 feet, 6 inches. This would be the first newly built Foss tug of steel construction, although two older Puget Sound based tugs engaged in barge and log towing, the 1904 built Wedell Foss and 1909 built Mathilda Foss were also of steel construction. The Brynn Foss in 1952. Once the design was presented to Foss management and approved, the construction of the tug was awarded to Reliable Welding Works of Olympia in early 1951. Reliable was contracted to build the hull and the trunk cabin. The machinery installation, the pilot house, and all the “finish” work were to be completed at the Foss yard in Tacoma. 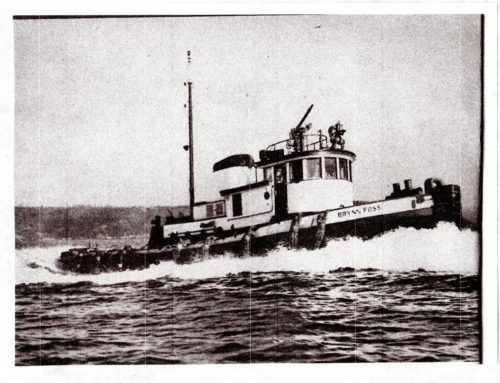 Five months after construction began, the tug was launched in Olympia and towed to Tacoma by the 200 horsepower Carl Foss. Prior to launching, the tug was given the name Brynn Foss to honor the recently born middle daughter of Foss executive Drew Foss and his wife Donna. Once the Brynn arrived in Tacoma a new 800 horsepower, 6 cylinder, supairthermal direct drive Nordberg diesel was installed along with all the auxiliary equipment. This particular engine was selected as it offered the most efficient and compact power for the available engine space. A few of the modern features included a self- flushing head (toilet), electric heat throughout and electric cooking units in the galley and coffee bar. The tug was equipped with hydraulic steering gear, an air powered tow winch, anchor windlass and a powerful fire monitor for assisting in waterfront fires and washing scows. The Brynn was outfitted with ship-to-ship and ship-to-shore AM and FM marine radios. Most of the tugs had the ship-to-ship AM radios but the ship-to-shore (office) FM radios were just becoming available with the Brynn being one of only three Foss tugs to be so equipped. Excluding the ocean-class tugs in the Foss fleet at the time, the Brynn was the most powerful Foss tug working on Puget Sound. The three Foss skippers re-assigned from the Peter Foss were Captains Leonard Sund, Vern Wright and Art Wickstrom. For the next 18 years the Brynn performed flawlessly and held the title “pride of the Tacoma fleet.” Ship assists demanded most of the Brynn’s time, but barge and log raft shifting was still a part of the daily assignments. The size and volume of ships calling in Tacoma continued to grow to the extent that by 1970 a more powerful tug was needed to supplement the service s of the Brynn. With the arrival of the Foss designed new-build Shelley Foss for ship assist work in Seattle, the 1200 horsepower Shannon Foss was re-assigned to Tacoma as the primary ship assist tug in late 1970. March of 1971 saw the Brynn leave the friendly confines of Tacoma Harbor to begin seven years of linehaul towing between ports on Puget Sound and British Columbia. However, a major engine failure in January of 1978 sealed the fate of the Brynn. She was “dead-lined” at the Foss terminal in Seattle, where she remained for the next five years. She was sold in early 1985 to an Alaska company based in Ketchikan where it was repowered and used for many years for inland towing in Southeast Alaska. Editor’s Note: Mike Skalley is the retired Foss billing manager, former company historian, and has written several books about Foss. Foss later gave the name Brynn Foss to a modern tractor tug, which is in service in Southern California.